Just 112 kilometres south-west of Adelaide, Kangaroo Island is a beautiful pristine paradise that is one of Australia's most popular attractions for international visitors. However, while it's very popular with tourists from overseas, many Australians have unfortunately never experienced its wonders. 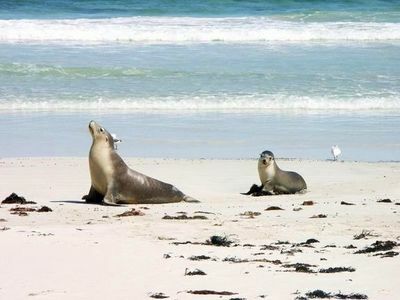 Have you ever visited Kangaroo Island, and if so, do you go regularly? Where do you stay and what do you do there? Do you fly over or take the vehicle ferry? If you're a regular visitor, what tips would you like to share with those who are planning their first visit? Ive had the pleasure of going to Kangaroo Island quite a few times, sometimes for work and a few times for pleasure. Aside from the fact that I was getting paid, it is always better when I have gone for pleasure! That is a place I have never visited and for some reason, would love to visit. I knew someone years ago who went there a lot. I don't even know how large or small it is, but it is one of the many things on my bucket list! Yes, have been there twice. But want to do it again, this time without the kids so I can experience the highlights without having to keep them occupied the whole time. I like National Parks Ranger in the kangaroo island, this place have a kangaroos, wallabies, koalas, echidnas and Sea-lions frolic and laze about on this stunning beach. It's perfect for rest and travel with family. Melbourne's best New Age shops?